CHILDREN in Scotland are eating more their recommended daily sugar intake - in sweet treats alone. Research to mark Sugar Awareness Week shows kids in Scotland are eating the equivalent of two-and-a-half 1kg bags of sugar a year just by going to friends' birthday parties. Easter weekend sees Scottish children consume an average of 392g of sugar, 259g at Halloween - and over the Christmas period a huge 1,628g. 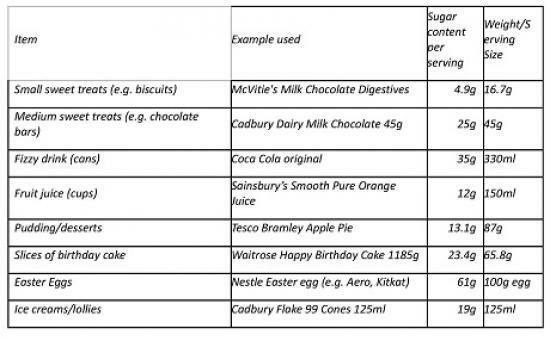 The government recommends that children aged 16 should eat an average of no more than 30g per day (27g for girls and 33g for boys), with 24g for 7-10-year-olds and 10g for 4-6-year-olds. But parents of under-16s in Scotland say their children are eating 45g of sugar on a typical school day just by eating extra treats, according to a survey for natural sweetener NatVia by Atomik Research. Paul Evans, Vice Chairman of the British Obesity Society and Operations Director for School Health UK, said: "This worrying survey shows British children are treating their way to a health timebomb. "Eating too much sugar is linked to obesity, heart problems, tooth decay and diabetes - and it will cost the NHS millions to treat these diseases in the future." Parents in Scotland claim their kids are eating on average three biscuits, twochocolate bars, two cans of fizzy drink and three cups of fruit juice during a typical school week day. Children in Scotland attend an average of 10 birthday parties a year where they consume an average of 267g of sugar at each one by munching on cake and sweets, among other sugary treats. This means that children in Scotland are eating an average of 2,670g of sugar at birthday parties alone over the course of the year. Most (95%) parents of under-16s say they put sweets into their children's party bags, with the most popular being bags of sweets (54%), lollipops (52%) and chocolate bars (52%). Easter sees children in Scotland chomp through an average of four eggs; with each egg containing an average of 61.6g of sugar, this amounts to 246g from chocolate eggs alone. And with children also tucking into bags of sweets and chocolate bars at Easter, parents believe their kids are eating as much as 392g of sugar from sweet treats. Summer sees children consuming an extra 336g of sugar a week on average as they eat three ice creams or lollies,on top of fizzy drinks and fruit juice. And just under a quarter (24%) of parents in Scotland say their child eats five or more ice creams or lollies during a week over the summer holidays. At Halloween, kids' sugar intake hits 259g as they indulge in an average of five small bags of sweets and five chocolate bars. Half (50%) of parents surveyed in Scotland say sweet treats are part of the fun of the occasion, and a fifth (21%) let their children decide how many sweets they eat. But a quarter (26%) of parents say they are not concerned at all about their kids' sugar consumption. Biggest worries for parents about their children’s sugar consumption was tooth decay (58%), dental cavities (46%) and obesity (43%). Sam Tew, Director of NatVia, said: "It is so important that children can enjoy themselves on special occasions. "But do they need a treat every day? How necessary is that bar of chocolate at the end of the school day? “Do they really need that lollipop as a reward or a can of fizzy drink if they are thirsty? By just pausing for a moment and asking ourselves these questions - and then replacing the sugary treat with a healthier snack, we could be creating a better future for the younger generation." Research Methodology - An online survey was conducted by Atomik Research among 2,000 parents of under-16s. The research fieldwork took place between 25thSeptember and 1stOctober 2018. Atomik Research is an independent creative market research agency that employs MRS-certified researchers and abides to MRS code.